As the winter approaches, (yes they do have a winter here) you can start to feel a chill come into the air. Like everything else here the word chill is relative. Today is about 32 degrees but when you have gotten used to the high 40's and even the mid 50's then a 15 degree drop in air temperature is significant and when it drops to 20 degrees at night (I know that's a fine summers day in Castlebar, not that there have been too many this year) but you really begin to feel it, although I must say it is a pleasant change from the incessant heat we have had for the last few months. The terrain is really starting to take its toll not only on the vehicles, we have had to replace three in the last month, but also on ourselves and most of us would have strains in the lower back and thighs from the constant bumping on the rocky desert. 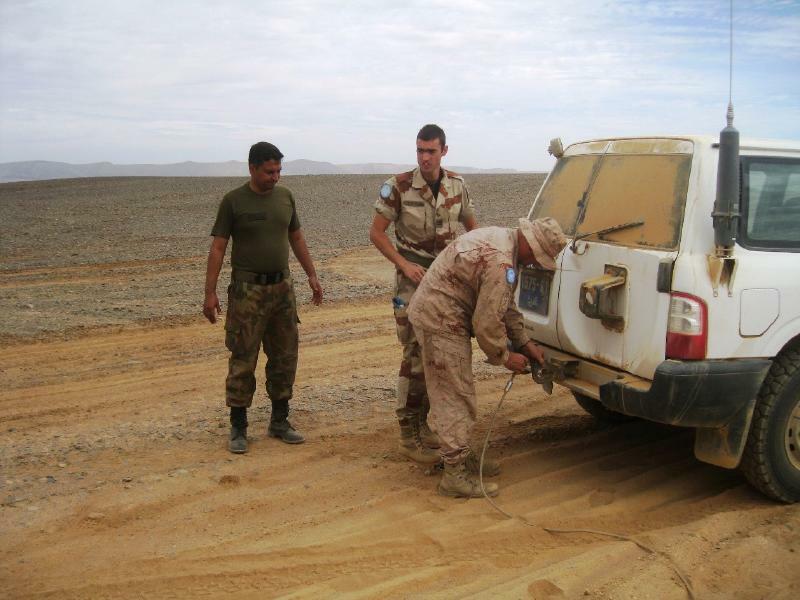 The pace of the patrolling has intensified after a brief respite when most of the Moroccan army units travelled outside the restricted areas to carry out their annual military exercises. This allowed us breathing space to try and qualify the new officers that had joined the team and also ensure that the vehicle maintenance was carried out. 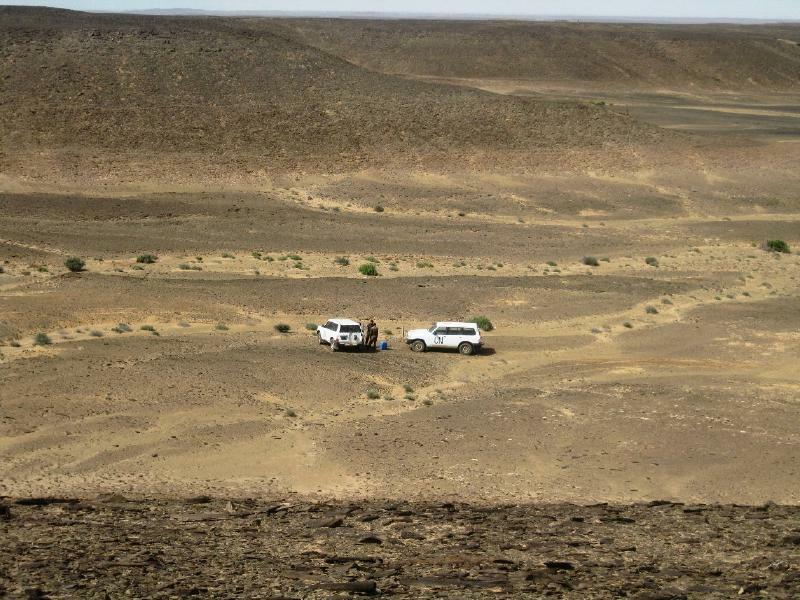 To paint a picture of the complexities of travelling in rough terrain, we had a patrol last week up to the northern area, approx. 320 km and on the way back the 2nd vehicle developed electrical problems. 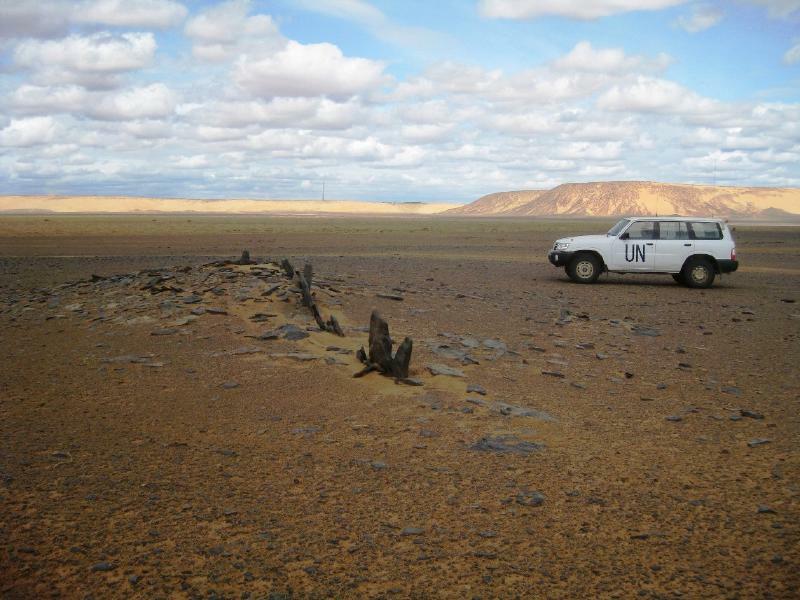 The choice was either another overnight in the desert or attempt to tow it to the nearest paved road where the UN recovery vehicle could carry out the repairs. Quickly we connected two heavy duty wire ropes with shackles and attached them to the vehicles. We then proceed slowly to head along a faint track towards the paved road. Towing a vehicle that has no engine power means that its braking capability is significantly reduced and this can of course be difficult enough on a flat road but over the bumpy and hilly desert can be difficult to say the least. As luck would have it we had just reached sight of the paved road when as we descended a small incline, the second vehicle strayed too close to the first one with the result that the wire rope connecting the two vehicles came loose, wrapped itself around the inside of the front wheel and when the lead vehicle took up the slack the steering arm was snapped in two, allowing the two front wheel to point in at each other. There was no magic tricks I learned from my father Paraic or indeed in Casey's garage that would fix this issue. A long 4 hour wait for a recovery vehicle ensued and then it was back to base, clean up and prepare to go out again!! But thankfully not all days are like that and when the sun is out and the heat is not too intense, the desert can be quite an interesting place. With a background in archaeology I have been literally tripping over artefacts. Because of the conflict there has been no real study carried out of our area and so far I have come across numerous prehistoric burial cairns, and arrowheads and scrapers dating to approx 4000 BC. 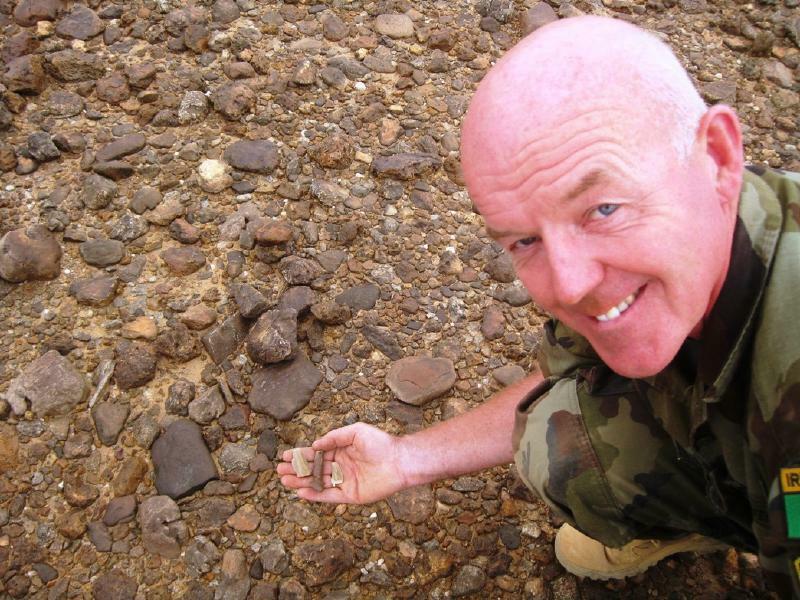 In one of the pictures you can see that I found 2 arrowheads and a spent 12.7 mm bullet, 6000 years of weaponry all within a metre!! Trying to put all this information together in a chronological manner is going to take time but at least it's a project for the occasional night when it's not busy. 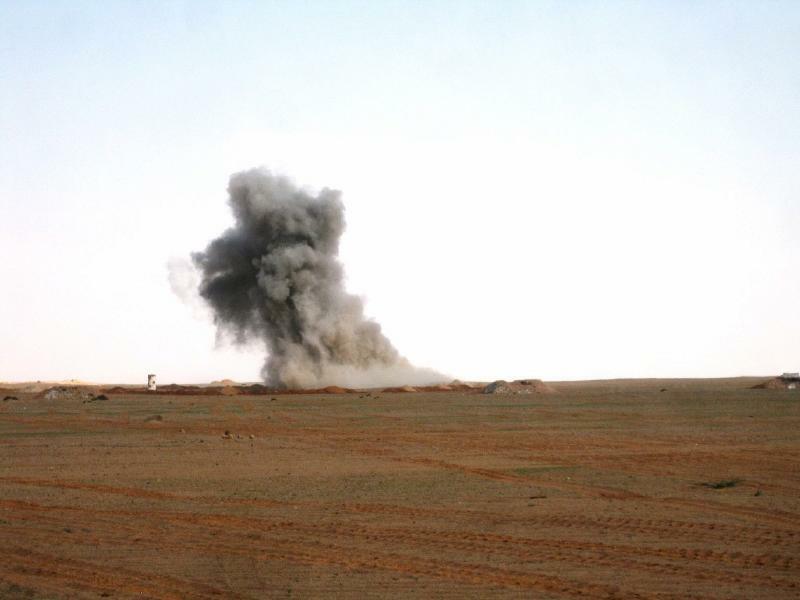 Another of our tasks here is monitoring the destruction of mines and UXO's Unexploded Ordnance, or otherwise known as ERW Explosive Remnants of War. Considering the battles that raged here between 1974 and 1991 there is a significant amount of stuff either deliberately placed, such as minefields or just lying around after some forgotten battle. 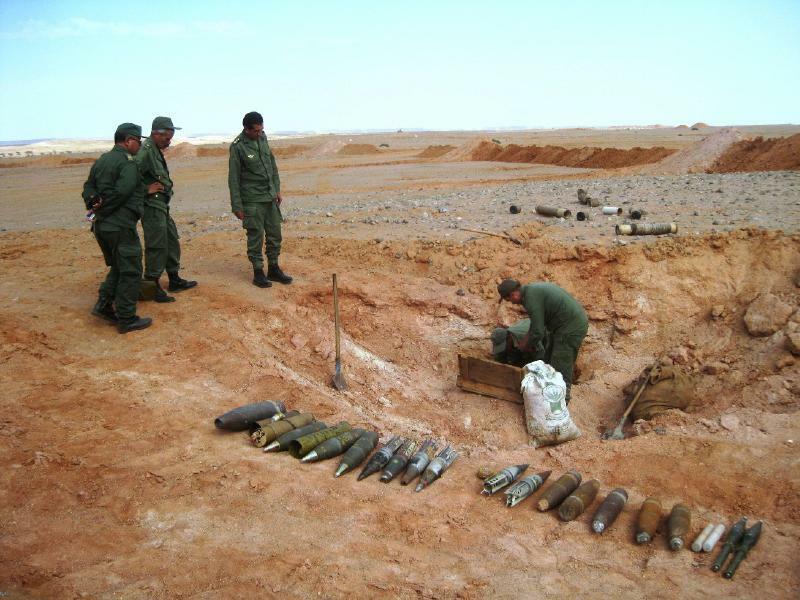 The problem is that all this stuff is generally live, despite the amount of time it has been lying in the desert and each year there are people either injured or killed by this ordnance. Two years ago a maintenance vehicle in the Paris-Dakar rally strayed off a track resulting in one fatality and two serious injuries. You can see in the attached pictures the type of stuff that needs to be destroyed on a regular basis. 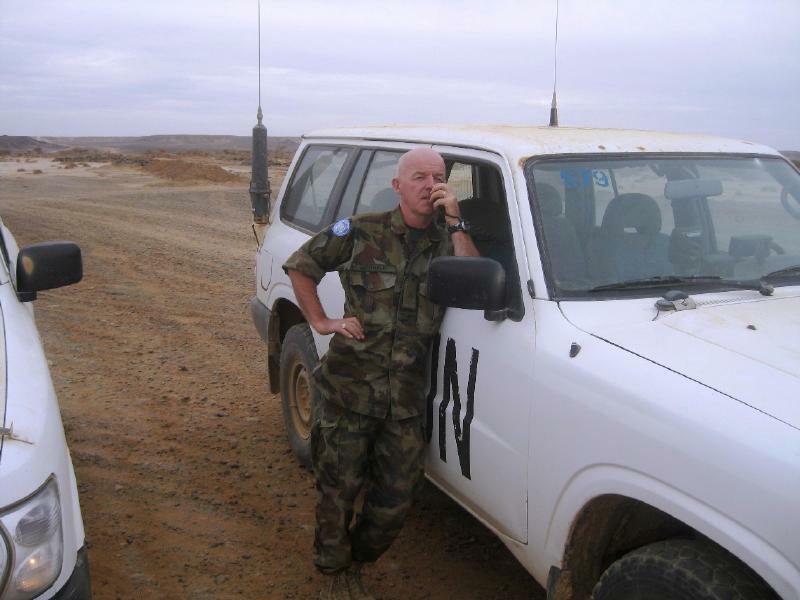 Time to sign off again and tomorrow I begin the long journey home for a 2 week break, 3 hours to the capitol Laayoune, then I fly 30 minutes to The Canaries, before getting a 4 ½ hour Ryanair flight to Dublin. Needless to say a cold medium in Johnnies is beckoning.